Sometimes more than one ride is required to find the perfect route, and such was the case with our transit to the top of Boone Ridge and on to Boone Spring. Last trip, we never made it to the spring because we ran into a cliff band, had to resort to Plan B, then ran out of time. This time, we tried a different route and also ran into a cliff band. We found a way around it, but while we were leading Boss and Coco over hill and dale, Coco escaped and ran off for a couple of hundred yards. That provided some excitement. Boone Springs is at just under 7000 feet, a little low for much snow accumulation at this time of year. The day was cool, but that didn't stop Daisy from taking a dip in the tank, which also provided the horses with a drink. I doubt we'll be exploring that side unless we can teach the horses to use technical climbing gear! By Wednesday morning, we had snow! After some study on where the Dominguez-Escalante Expedition crossed Strawberry Ridge in 1776, Steve thinks he's found the spot. Although the pass is unnamed, he has dubbed it Padre Pass, labeled in green in the photo above. 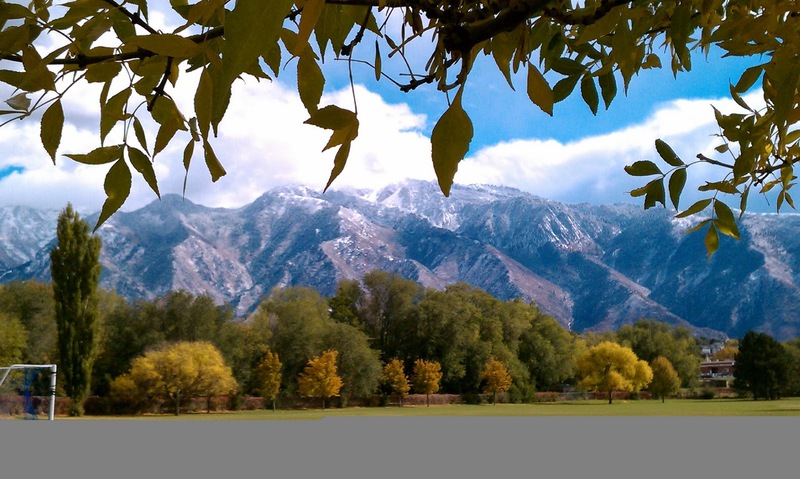 Padres Dominguez and Escalante were making their way from the valley that is now covered by Strawberry Reservoir (they called it Valle de Purisima) through the Wasatch Mountains to Utah Lake. They were the first non-native Americans known to venture through the area. We were drenched in orange, since it was the last day of elk season. These hunters watching from a ridge weren't likely to find any game, since any intelligent elk was surely in hiding, and any not-so-intelligent elk were probably goners already. All of this goes to show that following in the footsteps of history can be fun. Yes, hunting season in Utah continues. No, the above bullet-riddled object is not a deer, elk or antelope. Perhaps someone mistook it for a road target. 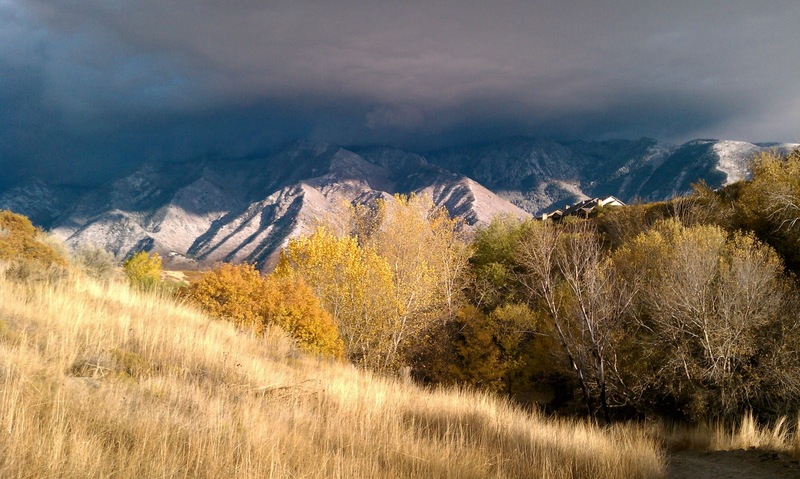 The sky looked cloudy last Sunday afternoon, but we defied the chance of raindrops and drove to the mouth of the Wasatch front's Little Cottonwood Canyon for a hike up Bell's Canyon. The cliffs in the Cottonwood Canyons are popular with climbers. The climbing walls have names such as Extreme Unction, Route of All Evil, and Demon's Dance. The sky cleared by the time we returned to the trailhead. No rain on our parade! We spent last weekend in Salt Lake City and enjoyed a couple of hikes in the Wasatch Range. The above photo was taken from the White Pine trail in Big Cottonwood canyon. Through the opening in the canyon, you can see Salt Lake Valley spread out below. We didn't mind. She's cute when she's asleep. 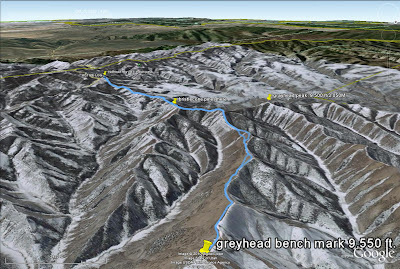 We've ridden to Grayhead Peak (9500 feet - shown above) before, but we've never ridden the ridges over to Grayhead benchmark, about 50 feet higher and 2.5 miles to the northeast as the crow flies. This time, we follow faint game trails over hill and dale, literally, to reach the benchmark. Mischief and I head uphill in the photo above. If you enlarge, you should be able to see the arrows I've used to show our "trail." Daisy is traveling with us again, now that she's made a complete recovery from being stepped on a couple of weeks ago. Since there were no creeks or springs on this ride, I rigged a drinking bowl and gave her some of my water. The horses can wait longer between drinks. Even though they went a total of 14 miles and 3800 feet elevation gain and loss, they did fine without water. We guess that it is the remains of a platform or tripod for a heliograph, a communication device featuring a mirror for simple Morse Code type messages. A heliograph may have been used by USGS surveyors long ago when the benchmark was placed, or perhaps by the Forest Service for communication between rangers. Up close, it indicates the way to a canyon, but who would ever see this sign? 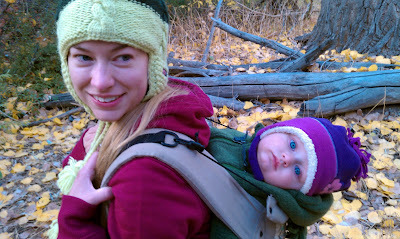 We spent the night just outside Dinosaur National Monument, and mounted up early the next day. Island Park and Split Mountain Canyon provided our view to the south as we started out. 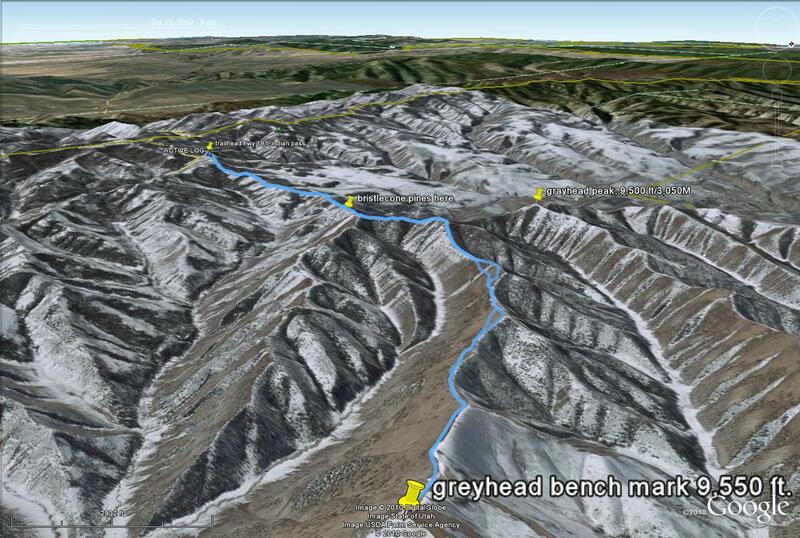 Our route involved descending into Garden Creek Valley. We had a little problem, though, because our map had 40 foot contour intervals, which could involve a gentle slope of 40 feet, or a cliff. In this case, there was a 40 foot cliff band we hadn't expected. You can't really see the cliff band in this photo, but we couldn't safely go that way. Oh, well. If at first you get cliffed out, go to Plan B. We returned to the two track we'd started on, and found another route.